What do you mean by Thesis essay writing or thesis statement? Thesis essay writing or statement is a sentence or a number of sentences which clears out the main idea of a particular writing. All the writings have a main idea which needs to be expressed clearly and subtly. Thesis statements help in this. It also helps in controlling the ideas to neither underflow nor overflow in the essay writing. Thesis statements tend to reflect on the argument or opinion, which the writer is expressing in the essay writing. The writer has made that opinion by reading about the topic or simply by researching about it. Thesis essay writing helps in knowing the nature of writing and the follow up required for it while writing. 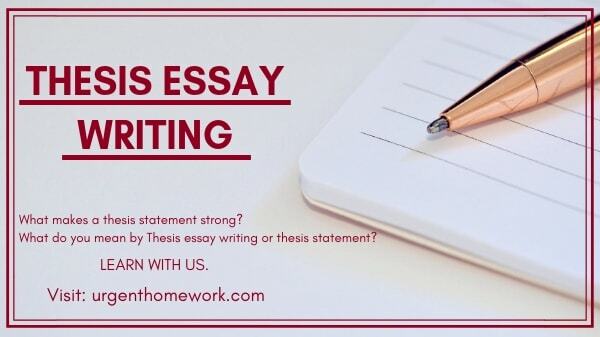 There are basically three types of thesis essay writing, expository; which exposes each and every facet of the topic and goes into details about it, analytical; which goes into higher analyses of the subject and its facets and argumentative; which arguments on behalf of a side in the essay write up and showcase its evidence and examples in the writing. Every writing has the main idea, main theme or main message. Thesis statement helps in taking that message out in the open and clear. What makes a thesis statement strong? The direction required in writing an essay and the limitations and boundaries required for the thesis essay writing is provided by a strong and firm thesis statement. It gives the limits on what you need to write about. It also helps in functioning as an informant to the readers of the essay in what you are going to explain in the essay, what is the topic about, overview and the context of the body of the essay. All the remaining part of the essay, whether it is the body, introduction and paragraphs should agree, argues or supports your thesis content. The nature of a thesis statement should be strong and fact-proven. All the thesis statements require strong examples, facts and points. It should be supported with a proof. Make sure it not just a mere statement without any strong fact or proof. You should be fully supportive and consider with your thesis statement, as it will help further in making the essay reading interesting for the reader. It should be motivating as well as captivating for the readers. The supporting evidence should support and interest your readers into reading further. A strong thesis statement always helps the essay to be kept intact and controlling the ideas. What are the points to remember while writing a thesis essay? The thesis statement needs to be concise and very specific to-point. The ideas and theme which the essay represents should be clearly mentioned in a thesis statement. Try not to be too general but include all the important things which need to be mentioned. Being too general will result in omission of any important point or negligence. The language and writing style of the thesis statement should not be too complex or complicated. It should be written with good, simple and understandable language. The message should be clear with simpler words and phrases. It needs to be clear as a crystal. If the reader is not able to understand the thesis statement, then he or she may lose interest in the further part of the essay. The writer has to carefully explain the message and theme in the simplest form to the reader. Copying or using plagiarism as a tool for writing a thesis statement can never be accepted by any reader. Be original in writing your content, take help from various sources but just don’t copy them. An original content is always appreciated than any copied content. The thesis should original and well researched out. What are the things to accomplish for drafting the thesis essay statement? The writer should have a sound knowledge about the topic, on which he or she is going to write the essay. The topic should be familiar, or if not, should be made familiar with. It is very difficult to write an essay on a topic which you do not much vary about. Reflecting on personal experience or from variable sources might help extensively. Limit your topic to a certain presence. What you know about the subject is different and writing down about the topic on terms is different. Only mention the important points and most reliable parts of that topic. Don’t go too deep until or unless required. Brainstorm the subject if you have any trouble regarding the subject. Your thesis essay should not reflect any of the difficulty you faced I writing it. It should smooth, clear and full of confidence. Separate the points into categories for essay writing and understanding. Research as much as you can about the subject. If you see similar themes, also refer to them.